@acnningstunt Well spotted. 50 points to Gryffindor. I think they used the jump to hyperspace gif deliberately to troll Star Trek fans, then trolled Potter fans. Beautiful. We this week released Elisabeth Prasad's report running some of the numbers on whether compensating live kidney donors makes sense. She finds that the typical kidney transplant saves the Ministry of Health on net about $125,000 over the longer term: dialysis is expensive. Chris Bishop's Member's bill passed first reading and is off to committee. It increases compensation to live donors for lost wages from the current amounts offered by Work & Income (which range to $350 per week for up to 12 weeks) to 80% of the donor's wage. The average wage in New Zealand is about $1000. Compensating donors so that more can afford to make that gift makes sense, on a straight fiscal analysis, if it brings enough new organs into the system. If new nobody becomes a donor because of the increased payment, then we've likely still done the right thing in helping donors, but it won't save the government money. So here's the very simple maths on it. Suppose each new transplant saves the government $125,000 less the compensation paid to the donor. Suppose that, currently, compensation averages $300/week for donors and lasts 8 weeks. The government then is currently $122,600 better off with each transplant. Suppose that we move to full compensation. On average, donors earn the average wage. If they also take 8 weeks at $1000/week, the government is then $117,000 better off with each transplant. If the live donation rate doesn't change, the government is out $5600 per transplant as compared to the status quo. If there is at least one new transplant for every 21.9 existing transplants, then the move is fiscally neutral. There were 72 kidney transplants from living donors in 2014. So if three more people are able to donate a kidney thanks to the increase in compensation, the move saves lives and is fiscally neutral. If four more people are able to donate a kidney thanks to the increase in compensation, the move saves lives and saves money. Suppose we only get one new donor. One. In that case the government pays $403,200 to donors who would have donated anyway and $8000 to a donor who wouldn't have for a total of $411,200 in compensation. The net cost to MoH is then $288,600 for that single kidney - because they've had to compensate all the other donors at a higher rate. The recipient gets, in the indicative case of a 50 year old male, an additional 7.6 quality-adjusted life-years. The cost to MoH is then just under $38,000 per QALY. In the worst-case scenario, where zero new transplants happen, the government is out just over $400,000 and a pile of live organ donors who have helped to save others' lives enjoy better compensation for their time out of work. In the break-even scenario, for the government, three more lives are saved when three donors are able to make the gift. And each donation after that saves the government rather a bit of money - while saving lives and doing right by the donors. And note that all of this is predicated on my preferred 100% compensation regime. The break-even point using Bishop's 80% figure will be lower. The break-even point will also be lower if people take only 4 weeks in recuperation rather than 8. Elisabeth's report, and her Masters thesis on the topic, are here. I was on Radio NZ's Nights this week on the topic; you can listen here. And pick up a copy of this week's NBR for my article on it (a pre-pub here). There's a new PWC report on NZ's place in the global insurance industry. It notes that new product development and worries about insurer reputation are bigger issues here than elsewhere. I note that I've still been unable to find an insurer who will sell me a fairly simple sounding product: in the event of a big Wellington earthquake (we work out a satisfactory definition), I get a big cheque, no questions asked. I'd pay an annual premium based on the risk of that event occurring. This shouldn't be hard. It's even easier than my earlier proposal. I'm guessing that the transactions costs of setting up a first contract in anything weigh heavily where the expected market isn't big. Neilson said the NZIER report found the evidence for Treasury's argument was too narrow because it used data only from the global financial crisis years. He said it did not consider that KiwiSaver attracted young and low-income people who would not usually have been involved in formal savings schemes. "The analysis simply compared the results for the people in KiwiSaver with those who were not, as opposed to those in the target audience who joined KiwiSaver compared with those in the target audience who did not." "We need to compare apples with apples. People on a benefit can't afford to save and are likely to receive a higher income from New Zealand superannuation than they received during their adult lives on a benefit anyway. "At the other end of the scale, people who were saving for retirement by investing in rental property or a farm would be unlikely to use KiwiSaver other than to just pick up the KiwiSaver incentives. "For this group KiwiSaver would probably not increase their savings, it would only change the composition of their savings. Neither of these categories were in the target group for KiwiSaver and should not have been used for comparison," Neilson said. I haven't read the NZIER piece yet. But I'm familiar with Treasury's work in the area. While the Treasury's 2011 work was based on a 2010 sample, their more recent 2014 work was based on SoFIE and IRD data covering 2002-2010. They have a panel of 10,000 individuals from 2002 through 2010. The 2014 paper uses a difference-in-difference analysis looking at those who joined Kiwisaver as compared to those who didn't; they also ran diff-in-diff after sorting by age, gender and the like. The point of difference-in-difference is to let you compare those who joined with those who didn't in a way that's meaningful. The differences in the savings rates for the two groups in the period before Kiwisaver forms your baseline; the differences in the savings rate afterwards forms your treatment effect. Sure, there can be plenty of differences between the two groups. But those underlying differences are caught in the first differencing in the difference-in-difference. It somewhat odd to critique a difference-in-difference analysis for just comparing two groups. They found that KiwiSaver members accumulated less wealth than non-KiwiSaver members, correcting for other stuff. This is in the difference-in-difference: those joining KiwiSaver accumulated less wealth than those not joining, as compared to how both were doing before KiwiSaver. If you want to restrict analysis to the ones that are really targeted by Kiwisaver and evaluate it on that basis, that's way different from a standard "was this programme a good idea" analysis. Think of it this way. Suppose that there's some terrible disease. One person in a million gets it. The only cure is getting a vaccine at birth. The vaccine costs $100,000. A cost-benefit assessment looking at the programme as a whole will say it's a colossal waste of money: you don't spend a hundred billion dollars ($100,000 * 1 million people treated) to prevent one instance of a terrible disease. But if you looked at it only on a target audience perspective - the one guy who'd have gotten the disease, then it's worthwhile: $100,000 to save that life was worthwhile. It's still a pretty bad programme on the whole though. I will have to look up the NZIER report; it has to be better than what's here reported. Update: the NZIER report is here. On first cut, it seems very odd to hang a lot on the behavioural economics literature around people screwing up savings when recommending a programme the default products of which are often entirely wrong for the person directed into them. So, what's the deal with special licences then? The Greens' minority view on legislation enabling extended bar hours during the Rugby World Cup noted that special licences can do the job that the legislation is meant to do, and that the committee heard no evidence of special licence applications being refused and no submissions from licensees dissatisfied with the process. Hospitality Association of New Zealand Otago branch president Mark Scully said it was a ''positive move''. ''It's a great move - it's good for the community,'' he said. Under existing legislation, bars could apply for a special licence to open for world cup games, but the process was ''very daunting'' and expensive, Mr Scully said. The Dunedin City Council had received two applications by yesterday for licences to screen world cup games. Both bids were opposed by police and a hearing was set down for a fortnight's time, council liquor licensing co-ordinator Kevin Mechen said. Whether that hearing proceeded would depend on the nature of the legislation passed by parliament, he said. He expected further applications for special licences to come in as the tournament advanced if Mr Seymour's Bill was unsuccessful. The Otago Daily Times understands police had sought to impose further conditions on those wanting to open for world cup games such as ticket sale entry, bunting and that bars be forced to close before reopening for the games. Mr Scully said measures such as those proposed and the cost of a special licence meant many bars would not bother to apply. The Greens went on to note that while they didn't get submissions from bar owners during the short notice period for written submissions, they had a pile of submissions on that short notice from the NZ Med Association, the DHBs, Public Health folks and the Health Promotion Agency. I suppose that an alternative explanation is that small bars can't make time to provide quick turnaround written submissions while public health lobbyists employed by the government to write on the evils of alcohol are able to, on short notice, provide written submissions on the evils of alcohol. I agree with the Greens in one respect though. They recommend that a better approach would have Parliament encourage the District Licencing Committees that conditions on special licences be reasonable. That is the more general problem and the more general solution. But it requires having a chat with those veto players who use the power to object to impose rather onerous conditions, including ones that Parliament has already rejected. The power to say no is also the power to make the rules, or at least in part. Parliament legislates. But it also makes rules giving other people a bit of legislative power too. Parliament does this whenever it sets policies letting someone hold up or block someone else’s otherwise lawful activities. These "veto players" can demand concessions in exchange for not vetoing. Suppose your house has heritage features. A heritage society could threaten to make it hard for you to get consent for an addition onto the back of the house - unless you incorporate features that make them happy. Maybe they do not have the explicit right to do that, but because RMA processes let them make things hard for you, their veto power lets them extract concessions. The Dominion Post this week reported on the police’s use of veto power around alcohol policy. The police recently have seemed to be trying to establish regulatory powers that they were never granted through the Sale and Supply of Liquor Act. Because police and medical officers of health can hold up publicans’ and bottle shops’ liquor licences, they can demand concessions. In Wellington, they are only supporting new bottle stores downtown if the shops run restricted trading hours and only sell expensive products. Bar and bottle shop owners who do not want trouble with the police play along because that is the safer route. The costs to them of licence objections or of heavy handed police enforcement are too high. While the government explicitly rejected alcohol minimum pricing last year; the police are implementing it anyway, store by store. Parliament last week had to legislate around some of these veto players. The 2012 Sale and Supply of Liquor Act provided special permits to let bars open at non-standard hours during international sporting events. The Committee Report was explicit that this was one of the points of special permits. But, the veto players have said that international rugby matches on their own do not justify a special licence. And police have objected to World Cup special license applications. David Seymour’s bill allowing extended hours during the Rugby World Cup is great. But there is a bigger issue at play: the government needs to rein in the police lest Parliament again have to legislate around the veto player it created. How many divisions does 'intent' have? I wonder whether the government oughtn't pull its health and safety legislation and try again. Radio New Zealand reports on school principals' worries that they'll be subject to potentially large fines if kids are injured on school trips or on the playground. Workplace Relations and Safety Minister Michael Woodhouse said schools would need to ensure 'so far as is reasonably practicable' the health and safety of staff, and that its work did not endanger other people such as students and visitors. "Schools only need to do what is reasonably practicable and what is under their control. So if something goes wrong that is beyond the school's control, or if it has taken reasonably practicable steps to reduce the risk, it will not be held accountable." Mr Woodhouse said the maximum fines were only imposed in extreme circumstances for the most serious offences where the duty holder had been reckless. Principals Federation president Denise Torrey agrees teachers should be safe from punishment if they follow good procedures. But she said the mere possibility of stiff penalties could have a chilling effect. There can be a vast gulf between legislative intent and what winds up happening in practice: just look at the idiocy around Worksafe's implementation of procedures around scaffolding. If a Worksafe pedant thinks you, the principal, haven't been quite diligent enough in setting and documenting procedures, you could be in the hook for unspecified bad stuff. The monetary fines would be part of it, but the damning of the school's management in the Worksafe report would be at least as bad. Maybe if you fight it through the courts, you could get back to that you were compliant with the intent of the legislation and that it's Worksafe that's proven overzealous. But the damage would already be done. And so the natural risk-averse outcome among principals is to limit the risk by wrecking much of what makes New Zealand great: a generally free-range approach to kids. I don't know why National imagines that this won't happen. Well, maybe it's the long-game. If Labour wins in 2017, they'll get to fulminate in 2020 against the horrible Worksafe bureaucrats who, under Labour, wrecked the playgrounds and pushed us towards a nanny-state. And pretend that none of it was their own fault. Also, any legislation resulting in secret evidence preventing defendants from seeing the evidence against them is absolutely absurd. Isn't it better to hold things off for a few months and get this right? Jason Brennan says Singer's standard requires too much. Recall that, in Singer's thought experiment, if you'd be willing to ruin your $500 iPhone by jumping into a pool to save a drowning child, you should also be willing to spend $500 to save a child's life. Since there are plenty of charities in the third world that can save lives at fairly low cost, people are not consistent if they would do the former but do not do the latter. But the central problem with Singer’s thought experiment is that it is *not* analogous to the situation we find ourselves in. In Singer’s drowning child thought experiment, I save one life at some personal expense, and then move on with my life. I don’t remain in perpetual service to others. You’re walking alone one day, when you come across millions of drowning children. The children you save will for the most part remain saved, though some might fall back in. However, no matter how many you save, there will always be more about to drown. You can spend your entire waking life pulling children out of pools. Singer’s entire argument rests upon people’s moral intuitions in the One Drowning Child. But One Drowning Child doesn’t do the work he needs it to do, because One Drowning Child isn’t analogous to the situation Singer thinks we actually find ourselves in. Instead, what Singer needs to do is determine what people’s moral intuitions are in Many Drowning Children. Even if you judge you must save the one child in One Drowning Child, you might not judge that you must dedicate your life to, or even spend a huge amount of time on, saving children in Many Drowning Children. Note that I am not claiming that Singer’s conclusions are wrong, just that his argument for those conclusions doesn’t succeed. I'm reminded of a time I was walking our then four year old to daycare. We came upon an earthworm on the sidewalk. The rain had ended and the worm would likely die without intervention. We picked up the worm and put it onto the lawn. Then we turned the corner and saw several hundred worms on the sidewalk. She prepared to start picking them all up, and I instead brought her on to daycare. There are only so many hours in a day. Peter Singer argues that not only do we have a moral duty to be organ donors, we should also consider incentives for donation. One of the key contributors to low donation rates is the fact up to 50 per cent of families, when asked, say "no" to a donation request. In our view, despite the difficult emotional circumstances, this is a gross ethical failing. When the cost to a person of performing some moral action is small, and the benefit to others is great, there is a duty of easy rescue to provide that benefit. When you can save a life with a unit of blood, you have a moral obligation to give that unit. Donating organs after death is the easiest rescue of all, because there is no cost to giving organs in these circumstances. We don't need them, and they will otherwise be buried or cremated. Because a single donor can provide organs and tissue that benefit up to 10 other people, to choose not to donate is to allow those individuals to unnecessarily die or continue to suffer. He recommends shifting to an opt-out system and allowing binding registries blocking family over-ride. But unless doctors also shift to then either not consulting with families or ignoring family objections, or unless doctors combine opt-out with fairly rigorous exhortation of donors' families to allow donation (as is the case in Spain), it won't do as much good as Singer and I might hope. There's also the risk that binding registries might do as much to block families from opting somebody in as they would to prevent families from opting you out. Third, we should consider providing incentives to individuals and families to encourage them to donate. Last year, a group of leading medical specialists, bioethicists, religious leaders, economists and others sent an open letter to United States President Barack Obama suggesting that pilot programs should test whether regulated benefits to living donors – including financial incentives such as payments into their superannuation funds – would increase the supply of kidneys in ways that safeguard the rights and health of donors. For deceased donors, incentives could include financial contributions to funeral expenses – just as many universities offer free ceremonies and cremation for those who donate their bodies to medical research. Incentive policies could also be non-financial. One promising idea is offering prioritisation in the receipt of organs for those who sign up as donors without the possibility of family veto. Israel adopted such an approach in 2012, but it also exists in Singapore and the US (for living donors). Such an approach can operate on a points-based system – awarding additional points to willing donors, while still taking account of other factors, such as time on the waiting list and medical need. If this approach worked to increase supply, then everyone who needs an organ – even those who choose not to sign up – may benefit. A rising tide can lift all boats. Becker and Elias found that about $15,000 in compensation would provide the United States with as many live kidney donors as would be required to solve the shortage. And while results on Israel's priority system for cadaveric donation have been less than conclusive, giving live donors priority while providing them compensation seems to have increased donation rates. Around the world, accidental entrepreneurs create hundreds of thousands of jobs and the necessary prosperity that fuels government coffers to pay for public health care and public education. But politicians of all stripes appear to love a different kind of entrepreneur – let’s call them co-created entrepreneurs. An accidental entrepreneur is someone who brings to bear a vision to change the world and possesses a rare combination of risk tolerance, charisma, empathy and demonstrable skills. My own anecdotal experience puts the average age of this special subset of entrepreneur at about 40, meaning that they have real-world experience and are motivated to solve real-world problems. A “co-created” entrepreneur is someone, perhaps a taxpayer-funded post-doctoral student or academic, who is seduced into entrepreneurship by a government program, by a “centre of excellence funding grant” or by something entirely different – such as being unemployed. The great rolling global recession, about to hit Canada like a boxer’s uppercut, will be a boon for start-ups. Some in the co-created group can enjoy great success, but any sober seed investor with experience would put all their chips on the accidental entrepreneur. And yet, we are often told that risk must be underwritten by government or debt. A recent taxpayer-funded lottery commercial features a young gambler dreaming that she would start her own business if she won. Seriously? In Silicon Valley or Haifa or St. Louis (which is on overdrive with bootstrapped startups), that logic would seem bizarre. Apple, Facebook, LinkedIn and Huffington Post – such companies always had the ambition to win market dominance in every region of the world, not just in Silicon Valley. By contrast, taxpayer-support programs for co-created entrepreneurs often have as one of their major goals an overtly political agenda – irrelevant to shareholders’ interests – of “showcasing” the innovation brand of the host city or region. Entrepreneurialism is about failure; ask any early-stage investor. But it’s better to fail fast and, if you succeed, to scale quickly. And you are vastly more likely to succeed without top-down government support. It’s not just me saying this – it’s every objective economic analysis from every part of the world. If you asked entrepreneurs, they would tell you the same thing. Yet in Canada, few soi-disant taxpayer-funded experts talk to real entrepreneurs. Josh Lerner, author of Boulevard of Broken Dreams: Why Public Efforts to Boost Entrepreneurship and Venture Capital Have Failed – and What to Do About It, has decimated the idea that there is any evidence to suggest direct government aid can help entrepreneurs. From Dubai to Jamaica to Taiwan to Singapore to the United States, the co-created entrepreneur model has flopped. You just don’t find accidental entrepreneurs in government-funded policy slush. Many reports on entrepreneurialism are stacked with insights from professional executives, academics and venture capitalists – entrepreneurs themselves are conspicuously not leading the discussion. Publicly funded academics figure prominently. All of this white-papering is well intentioned. But it cartoons innovation and assumes, wrongly, that entrepreneurialism needs to be “nurtured” with the help of public money and policy advisers. For the taxpayer’s sake, let us please rid ourselves of this cognitive bias. I keep being reminded of one difference between Canada and New Zealand: the culture of permissionless innovation. In New Zealand, a whole ton of microbreweries and some distilleries started in somebody's garage. After the brewer found that there was a market for the product, he or she could scale up. Canada's state monopoly buyers and licencing regimes, at least in some provinces, make that awfully hard (though it has gotten a bit better in Manitoba). Let's hope New Zealand doesn't get too far down the track of incubators and accelerators and instead keeps a sharp eye on the system of permissionless innovation that lets entrepreneurs get ahead. It's too easy for the tangle of regulations to stymie it. Well before all the recent controversies over replicability, DeLong and Lang wondered whether file-drawer effects mightn't mean that all economic hypotheses were, in fact, false. If statistically insignificant empirical results get filed away rather than published, it's hard to tell which hypotheses really are supported in the literature. Meta-analyses have gotten better since then, and funnel plots can help indicate whether file drawer effects have been important. All previous times the Hare beat the Tortoise, nobody wrote a fable about it. In order to hold a show ballet schools are supposed to get a licence. Many schools fail to do this. In my bid to get a licence for Frozen I had to apply to Disney. I am very disappointed that they denied access to the music for this event. For this reason I have had to seek alternative ideas and music choices (quite disappointing given this is non-profit and promotes their works). Young Eleanor will be very disappointed. For unfathomable 5-year-old-girl reasons, she is a fan of Elsa. But there is hope: when she was a bit bored at the barre a couple of lessons ago, she unscrewed the fastener holding the barre to the wall and handed her mother a handful of liberated screws. If income inequality is bad, in part, because those on lower incomes feel bad about their absolute levels of income when others are doing better, what is appropriate policy on this one? As always, which inequalities matter for policy is at least as interesting as the stats on any particular margin. Economic Management was the work of many. It was the pooled work of many divisions, only two of which were economic divisions. My input related to areas that involved Economics I division, which was where I was the time. The central figure was Dr Graham Scott. He led and coordinated its production, oversaw its contents and structure and wrote some of the major sections himself. Murray Horn helped Graham pull it together. Graham reported to Jas McKenzie who was also a major intellectual force. Roger Kerr's role was seminal as head of Economics II division. But his team contained very impressive people pulling their weight. All in all it was an incredible team effort, having to be written in a few weeks because of the snap election, when public policy settings were unsustainable. Economics II at the time was staffed by some excellent young economists, but the only one that I can think of who had a recent US university education at the time was Rob Cameron. He studied at Harvard's Kennedy School as I recall. (He was on a Harkness Fellowship). The Kennedy School was not Milton Friedman's Chicago. Rod Deane was never a member of Treasury's "Think Tank". He was in the Reserve Bank. There was no special adviser called Doug "Anthony". Perhaps you meant Doug Andrew. Economic Management was not a monetarist document. If anything it reflected a Harvard/Yale view rather than a Chicago view. For example, it did not advocate target growth rates for M2, or any other monetary or credit aggregate. The foreign exchange crisis in 1984 was real. The outflow of cash in that last few months of Sir Robert Muldoon's administration was such that the Reserve Bank did not have the reserves left to defend the currency on the Monday after the election on any prudent projection of the likely demand. This was no figment of anyone's imagination. The notion you try to convey through double quotes of a contrived conspiracy theory is spin that is detached from this reality. Where am I reported as saying that "racist attitudes and red tape were making New Zealand one of the most restrictive regimes in the world"? 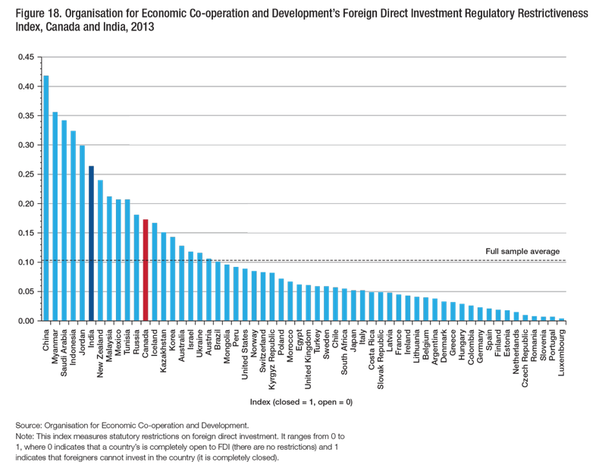 New Zealand does have one of the most restrictive regimes (involving red tape) on the OECD's measure. 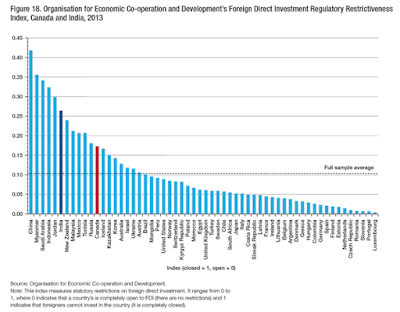 (See chapter 3 of The New Zealand Initiative's 2013 report Capital Doldrums summarises international rankings of NZ's FDI regime, in particular chart 7 on page 25.) Fear of foreign influence does not have to be primarily racist. I made this clear in some of my interviews, but I don't know to what extent those components were broadcast. For the record, I don't think racism is a major factor behind NZ's regime. I doubt if it is even a material factor. Who in NZ would feel racist towards Australians, for example? No changes to ISP liability on copyright infringement. Ending parallel import would have been close to a deal-breaker for me, so glad to see that's off the table. Imagine campaigning, in New Zealand, for the adoption of Finnish regulations on foreign direct investment into New Zealand. Everybody loves Finland - especially on the left. Or for regulations matching those in the Netherlands. Or Denmark. Heck, or even France. Stay away from any specifics about what the changes would mean - just point to how nice the Scandanavian countries are and let mood affiliation take care of the rest. It would be a massive deregulation and liberalisation, but you wouldn't have to say that part too loudly. Via IRPP, here's how a few countries compare. New Zealand is 7th most restrictive on this measure. Only China, Myanmar, Saudi Arabia, Indonesia, Jordan, and India are worse. I'm rather sure that Bryce was Canterbury trained: one of the Gnomes. I cannot imagine having been willing to move to New Zealand had Bryce and his 80s colleagues not achieved the changes they then made. I'm very proud to have him as a colleague. NZ First MP Tracey Martin has claimed Curwen Rolinson is in breach of the Harmful Digital Communications Act, passed in July. In a blog post, Rolinson, former leader of the NZ First youth wing, accused Martin of undermining party MP Andrew Williams. Speaking at the University of Otago last week, Martin suggested that Rolinson was in breach of the law as a result of a blog post written on 6 July, four days after the Act was officially made into law. “I’ve been working on the Harmful Digital Communications bill and what Curwen [Rolinson] did, what Whaleoil [blogger Cameron Slater] does, that’s harmful digital communications,” said Martin. Rolinson made accusations last month in a post written on blogging site The Daily Blog. The former youth leader claimed that Martin spread rumours about NZ First MP Andrew Williams in an attempt marginalise him. According to Rolinson, Williams had been flagged as a likely candidate for the deputy leadership role following the 2011 election. “Martin was lobbying hard for the position of deputy. It was not so much about what she could offer. It was about Williams’ alleged unsuitability for the role. He was called a sexist. A bully. An alcoholic. Rumours were spread throughout the party that Williams had attempted to initiate a physical altercation with Winston [Peters],” wrote Rolinson. Martin was appointed the deputy leader of NZ First in 2011. The blog goes on to suggest that Martin colluded with her mother, Anne Martin, when she was the party president in order to remove Andrew Williams from the party list. I am not a lawyer, but if the allegations are not truthful, and they were published, then it would seem that defamation would have applied. One wonders whether the point of the Bill, in the view of some MPs, was to silence critics. The discussion documents on GST on services seem far less crazy than they could have. But there is one huge potential fishhook. On the good side, the government at least is indicating a bit of realism about the likelihood of getting foreign suppliers to act as tax collection agents for the New Zealand government. That's why they're soliciting comments about a threshold: suppliers doing less than some amount of trade in services with New Zealand customers wouldn't need to collect tax. It looks like they're intending on hitting the larger ones that might find the fixed costs to be manageable. But there's one huge potential fishhook. Paragraphs 7.14-7.16 lay out what can happen for consumers who try to pretend that they're business customers to get an ex-GST price. Businesses buying intermediate services from abroad would just claim the GST back anyway when charging it on the final sale here. People pretending to be GST-registered businesses are engaging in tax evasion and should have the usual tax-evasion stuff happen. It's the other category that could pose the problem. Customers could pretend to be resident elsewhere to avoid GST. When I'd first read this, I thought about, say, somebody hiring a kitchen design expert from abroad for some expensive home renovation while pretending to be based elsewhere. That would pretty clearly be tax evasion. Paragraph 7.15 talks about people supplying incorrect information to avoid being charged GST; this seemed the natural kind of read. But Ben Craven points out that IRD could choose to interpret this as also including folks using VPNs to access foreign content. If IRD thinks you're doing that to avoid GST, rather than to get three times the content, then the tax people could shut down parallel importation of digital content in ways that rights-holders here have thus far mostly been unable to do. And if that's the case, it might time for pitchforks and torches. Salient's Emma Hurley asked me for comment on the economics of prison labour. Victoria University contracts with one of the prisons for laundry services, and the prisoners are not there paid very much. She asked me whether that's acceptable and whether it has negative effects on the rest of the economy. Her story is here. She didn't wind up having room for my comments, but here's what I'd told her. I’m afraid I don’t have any clear-cut answers for you, only trade-offs. Working while in prison can be an important part of prisoner rehabilitation. Getting work experience, having to meet set hours, and getting a supervisor’s attestation of the worker’s ability are all really important in helping somebody make the transition into work from criminal activity – and that’s not an easy ask, where a lot of employers are really scared of hiring a former criminal. The problem then is whether the prisoner’s labour is really worth the minimum wage. A lot of criminals were not in paid employment prior to incarceration. I do not have New Zealand data to hand, but I know that when I’d looked at some Australian statistics a few years ago, at least in one state, somewhere around 90% of those in prison were not in paid employment in the month before they were tried. Those coming from a criminal background tend not to have characteristics that employers find desirable. You would have a very difficult time in getting anyone to hire prisoners at the minimum wage, and you would then lose out all of the rehabilitation benefits that come from being in employment. Finally, you never ever want prisoner labour to be a profit centre for prisons. There’s a really bad history with that kind of thing in some parts of the US: under the convict lease system in American post-civil-war reconstruction, prisons would lease out convict labour and pocket the gains; they then had very strong incentive to have a lot of people in prison. If a low wage paid to prisoners is a way of providing profits to either public or privately run prisons, rather than a way of ensuring the broadest range of prisoners are able to benefit from employment, then that can be pretty undesirable. So we’re then firmly into trade-off territory. The higher the wage that prisoners make, the fewer of them that will gain benefits from work experience. Worse, the ones most in need of it will be the first ones shut-out. If the wage is very low and that results in prisons being able to earn strong profits from leasing out prison labour, that provides pretty bad incentives for the government: keeping people in jail should not be a profit-centre for the government. But if the wage is low because prison labour is not particularly productive and because the proceeds from the contracts run by the prisons are used for job training and skills enhancement for those in prison-based employment, that’s entirely different. I just do not know enough about the prisons’ financial statements to be able to make any calls there. Where prison labour makes up only a small fraction of the overall labour market, I do not expect it could have any large negative effects elsewhere in the economy. If prison contractors are the most effective way of providing things like laundry services, that could have less to do with labour costs and more to do with that they would already have huge boilers and wash facilities for their own needs that they could also put to contract work – again, I do not know, but it is likely to matter and oughtn’t be ignored. Private laundries would then be a bit smaller than otherwise and people who would have been employed in private laundry services would be employed elsewhere instead. It’s probably best to think of the problem in two parts. The first part of it is sorting out the best rehabilitation set-up for prisoners, which can involve prison labour. Set the wage rates in prison to make sure that the prisons provide rehabilitation most effectively – and while watching that prisons are not using prison labour as strong profit centre. If that is all set correctly, then we can come to the second part. You can really think of prison labour in that case as being little different from trade with a foreign country with different cost structures. It will affect what work is done in the non-prison-sector in New Zealand, but should not affect the total quantity of work. When Vic can save a bit of money on laundry, they’ll spend it elsewhere, or students will be charged a bit less than otherwise, or the government will have to give a bit less money to Vic. All of those have positive employment consequences elsewhere in the economy that are not as visible as whatever effects obtain on the laundry industry, but are every bit as real. I did a bit of consulting work for the Hospitality Association last year around bar closing times and attended some of the hearings in Nelson about the Tasman closing hours. A lot of publicans there made the case that while they very rarely used the long hours they were allowed, it was really valuable to them. Why? Because when an important sporting match is on half-way around the world, they want to be able to air it for their patrons. There is provision in local alcohol policies for seeking special licences for special events. But, the cops there, if I recall correctly, in their evidence were pretty clear that they did not consider airing a rugby game to be a special event. There'd have to be more to it than that. And, on the publicans' side, the impression was that the police were ridiculously heavy handed around granting permits and enforcing them. Further, the local licensing officer admitted that he'd never had any problems with the bars' existing closing times. And so Parliament has had to legislate around the cops. We now have national legislation in the works specifying, at a national level, when local alcohol policies' bar closing times are suspended for major sporting events. National wants it only to be for All Blacks' events; Labour wants it to be for all sporting events. But none of it would be necessary if the police and medical officers of health were less obstreperous about bar licencing. From the chats I've since had with publicans, and from the news stories about police imposing conditions on new off-licences, the cops and medical officers of health are using their power to object to licences to enact, through regulation, the stuff they couldn't achieve when they lobbied to have it included in local alcohol policies or national level legislation: things like minimum alcohol pricing and restrictive hours. Terry Moe pointed out in the American public choice literature that the President's veto power grants him some legislative power: if he can threaten to veto legislation that's too far from his preference, he can shift the nature of the legislation that faces him. The same thing seems to be going on with the police, medical officers of health, and alcohol policy. National legislation around bar closing times for special events treats a symptom of a bigger problem. More substantial fixes may be needed. Either somebody has to challenge the cops on this stuff through the courts, which is really expensive for a small bar or bottleshop, or Parliament needs to make a bigger shift. I wonder what would happen if District Councils received, say, 10% of the alcohol excise from alcohol sold in their districts. Excise is meant to internalise the external costs imposed from harmful alcohol use. Some of that will be the costs of heavy drinking on the public health system; some of it will be policing costs. But some of it is just nuisance that local councils have to deal with and for which they are not at all compensated. That councils then are a bit ambivalent about local nightlife and pretty happy to let the cops dictate alcohol policy is not all that surprising. Shift the incentives, change the game. Congrats to David Seymour for getting the current fix up to Parliament. But we might need something a bit bigger yet. In response to concerns around champagne breakfasts and international sporting events outside the maximum hours, we recommend amending the Bill to permit special licences outside the maximum hours. Special licences may only be issued for a particular event or series of events, and should therefore permit such occasions without creating a way for licensees to remain open outside maximum hours on a business-as-usual basis. Hat-tip to Graeme Edgeler, over in the NBR's comments section. If there's any low-hanging fruit in quake-strengthening, it's unreinforced masonry facades, parapets, and chimneys. They tend to fall outwards from buildings onto passers by. Tieing them back can be pretty cheap relative to other earthquake strengthening. And, there's a much stronger market failure case for addressing parts of buildings that will fall on top of passers-by than those that will fall onto the building's owner or tenants. The owner of the building next to the one that fell on her bus had strapped its façade and parapet: “His building hurt no one,” Ms Brower says. But the owner of the three adjoining addresses hadn’t been required to do the same after the September 2010 quake and so hadn’t done so. It's worth making sure that our heritage regulations are not making this kind of strengthening work impracticable.